I'm as mad as hell, and I'm not going to take this anymore! Do you hear me, Robert Venditti, Billy Tan, plus you funny-faced fools over at DC Comics? I'm not going to take it anymore. Unless you give me a fairly well presented comic book Published in August, 2014! To QUOTE Kimberly Caldwell: 'I take all of my life lessons, which some people might call 'mistakes,' and apply them to my future so that I keep growing'. Many characters. Five Emotions. And only just one hero's story. That is precisely what Hal Jordan is facing whilst he prances about this escapade entitled, 'Incursion'. For a start, he's rather willful when he incarcerates that villain he can't say the name of properly -- Rumpelstiltskin or whatever-it-is. He then feels pissed-off when nobody in the corps listens to a damn word his has to say -- as per usual. After that though, he feels happy when his family pay him an unexpected visit -- his family from Earth that is. Plus let's not forget he's also contemplative when he talks to his brother about the emotional spectrum, as well as nonchalant about the next cross-over event with the New Gods. Well, mainly because he doesn't know about it yet. Ha! Now in my most humble opinion this is the type of tale every comic book needs after a big expansive cross-over event. Well, dear reader. Let's face it. Occasionally some much need 'down-time' is greatly appreciated -- both for the reader and for the creators -- because this sort of 'day in the life' type scenario grounds a series in more ways than one. Firstly, as I just said, it allows for there to be a stop-gap between one story arc and the next. Secondly, it gives certain characters the opportunity to convey their inner-most feelings without any action taking place. And thirdly, by in large this style of story-telling technique feels more personal in tone, because it taps into a zeitgeist of humane characteristics. Personally speaking, what I enjoyed the most about this issue was how charming and refreshing all of the characters came across. Of course it did help that Billy Tan provided some very well-detailed art-work. Even though I don't want to take anything away from Robert Venditti's contribution, because in no uncertain terms he added one key component that made this tale stand out from the crowd. Personality. Ton's and ton's of personality. The only problem I had with this tale was how it tonally shifted gear one-third through its telling. You see, it started off by presenting a scenario where Hal was battling some funny looking space alien. 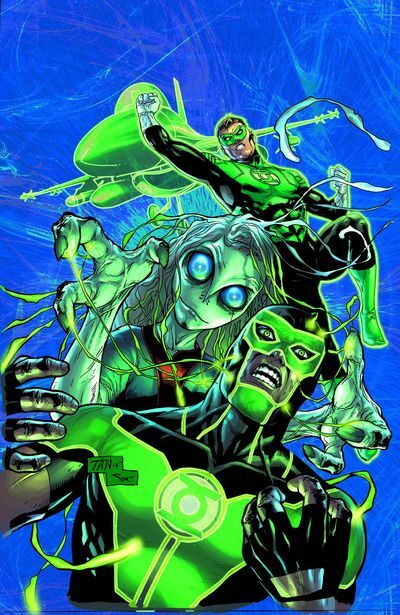 However, once it reached that stage of the plot where Hal's family was introduced, from a narrative level its tone shifted from an 'action adventure' to a 'family drama'. Of course I do mean this with all due respect. It's just the sudden shift in tone and flavor I had a problem with. Nothing else. Because this adventure came across as a 'day in the life' type tale, why don't I pair it up with the Beatles classic, 'A Day in the Life'? Works for me! In many ways I feel compelled to compare this comic book to 'a family picnic', mainly because where else would you see kids messing about in wide open spaces, whilst the grown-ups kick back and have a drink? Cheers. Oh, f*ck! We're all going to die now! Give me back all the money I've lent you, you b*stard. 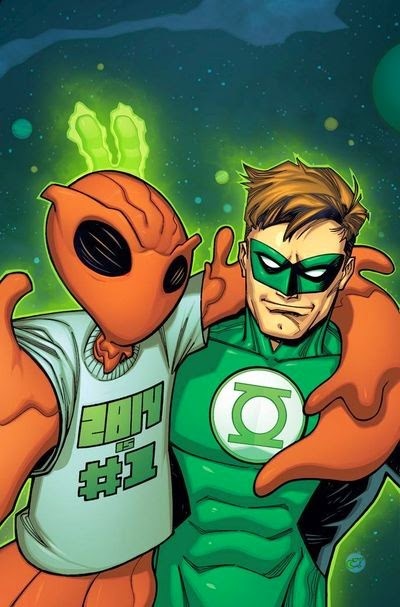 Wait a minute, Hal! Are you seriously trying to tell me that whenever my wife gets her 'time of the month' somehow it could affect the whole universe? Funnily enough, that whole thing about the 'emotional spectrum' reminded me of that time where we raped a raccoon. Ohhh! Those were the days. Hey! Don't worry about it, space-case. We're all going to die someday, anyway. Well, unless you're someone like Batman or Superman. Yeah. I see your problem, Hal. But you know the old saying, don't you? 'In the morning you beg to sleep more. In the afternoon you're dying to sleep. And at night you refuse to sleep'. Simply put, the emotional spectrum is sleep. Out of curiosity, bro, what color does masturbation fall under? Next time you find yourself at war, don't think about if its right for you to fight. Think of me and Sue and the kids.